On Friday, April, 20th, we’re making history with the first ever AZ Label Fest down at Crescent Ballroom. We’re partying it up before Record Store Day hits the valley, and you can come look at all the different independent record labels in town while also jamming out to some amazing music. Featured labels include Chromodyne, Slope Records, Fervor Records, SlyVinyl, 80/20 Records, No Affiliation Records, Dirty Water Records , CACTUS MAN RECORDS, Related Records, President Gator, Moone Records, Dekay Records/Productions, and Onus Records. 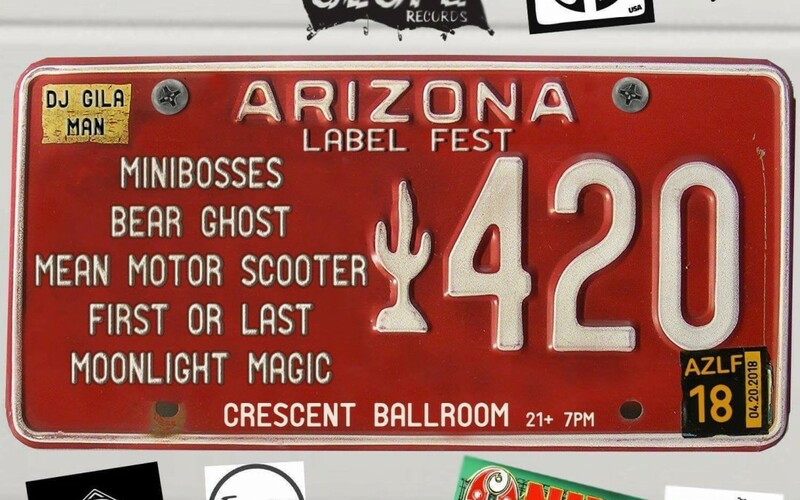 Artists playing AZ Label Fest: minibosses, Bear Ghost, Mean Motor Scooter, First Or Last, and Moonlight Magic. Doors open at 7 PM*, tickets are $5 pre-sale, and you can buy tickets at Crescent Ballroom, Stinkweeds records, and here. * = this event is 21 and over.